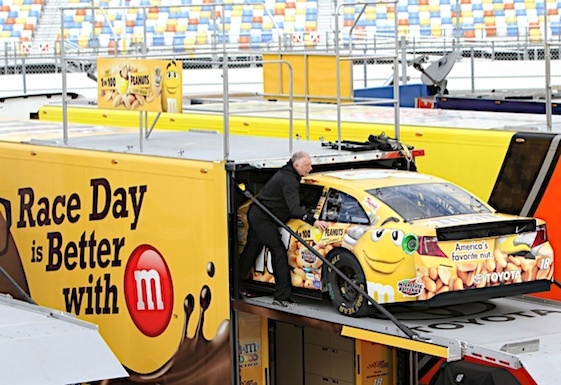 DAYTONA BEACH, Fla. – There was no shortage of optimism and storylines in the room during media day at Daytona International Speedway on Thursday as a steady stream of nearly 50 NASCAR drivers were paraded in front of the assembled press. Many drivers expressed confidence that they can depart Daytona next week with at least one trophy tucked underneath their shoulder. After missing the final third of last season when he suffered a broken leg, Tony Stewart pronounced himself ready to resume competition. The driver nicknamed “Smoke,” who was sporting gray in hair and walking with a noticeable limp on Thursday, admitted that his injured leg is only about 65 percent healed. But one of Stewart’s two new teammates, Kevin Harvick, came to the defense of the driver of the No. 14 Chevrolet when he shared a story about the flight home following a sponsor appearance earlier this week. “I knew Tony was a pretty intense guy, but we went to a Jimmy John’s event and we’re coming home Monday,” Harvick said. “He got on that plane and he was like a crazed lunatic. You could see that look in his eye. With the Sprint Cup cars set to roll for the first time on Friday, Matt Kenseth said he plans on using Saturday night’s as an elaborate practice session as he sets his sights on winning next Sunday’s Daytona 500. “I really look forward to the Unlimited this weekend just to kind of knock the rust off of everybody a little bit, get some pit stops in, get some laps on the track and draft a little bit,” said Kenseth, the 2003 Cup champion. “Outside of that, I really look forward to Thursday and running the Duels to try to get qualified for the race and get out there in race conditions. Even the underdog drivers were pulling out their Superman capes on Thursday. David Gilliland pushed his Front Row Motorsports teammate, David Ragan, to an improbable victory at Talladega Superspeedway last May. The Riverside, Calif. native, who is winless in 258 starts, figures it’s just a matter of time before he hoists a Cup trophy in victory lane. “My personal goal is obviously to try and win my first Cup race,” said Gilliland. “We’ve been close a couple times. We’ve finished second a couple of times and third, but haven’t been able to get that victory yet. But the comment that raised the most eyebrows on Thursday came from four-time Cup champion Jeff Gordon, who said he’s prepared to hang up his helmet if he manages to notch a fifth title this year. “I do this now because I love it, because I like being competitive and because I want another championship. I want to get a Sprint Cup championship,” Gordon said. “I go home and I look at my trophy room. I see four trophies, championship trophies. But they say Winston Cup on them. You can name me a four-time Sprint Cup champion for technical reasons all you want. But to me, I’m still not. I want that before my career is over.